BIRD Aerosystems, in cooperation with Textron Aviation Inc., a Textron Inc. company, display a unique surveillance special mission concept at the Paris Air Show in Textron’s static display. The concept transforms the class-leading Cessna Citation CJ4 platform into a sophisticated intelligence, surveillance and reconnaissance (ISR) special mission aircraft with BIRD’s field-proven Airborne Surveillance, Intelligence and Observation (ASIO) solution. Aeronautics Group, a leading UAS manufacturer, is showcasing its wide range of comprehensive defense solutions and UAS platforms at the Paris Air Show. For the very first time, the company presents the Pegasus 120: Aeronautics' first multi rotor platform. At the International Paris Air Show 2017, Aviation Specialties Unlimited (ASU) displayed a new product combination designed for a more rugged, lighter, comfortable mission experience with the new ASU aviation night vision helmet mount and battery pack known as the Aeronox along with the Aspida carbon Paraclete Aviation Life Support helmet with the Kairos Retention Assembly, and ASU white phosphor night vision goggles. At the International Paris Air Show 2017, ACTinBlack showcases its Dual Tube Night Vision Goggles (DTNVG). ACTinBlack is a precision optics company located in the heart of Europe, Luxembourg. Established and well connected across the European defense forces, they strive to become one of the top night vision manufactures. Safran Electronics & Defense has signed a contract with the Organization for Joint Armament Cooperation (OCCAR) to supply 18 more Strix optronic sights for the Tiger helicopter program. This latest tranche is part of France's revised 2014–19 defense spending plan, which calls for a homogenous fleet of 67 Tiger HAD (multi-role attack) helicopters. At the 2017 Paris Air Show in Le Bourget Elbit Systems launched SkyStriker – a remotely operated electro-optical, precise guided Loitering Munition(LM) designed to seek, locate and engage various targets for the tactical level corps. The new platform is based on Elbit Systems’ vast experience providing precise long-range tactical solutions. Textron Systems Unmanned Systems introduced of the NIGHTWARDEN Tactical Unmanned Aircraft System (TUAS) at the 2017 Paris Air Show. Building upon Textron Systems’ lineage of TUAS, the NIGHTWARDEN TUAS is the company’s new next-generation platform, representing the production-ready model of the developmental Shadow M2. At the Paris Air Show today, Lockheed Martin officials introduced the C-130J-SOF, the newest Super Hercules aircraft configured for international military special operations requirements. At Paris Air Show 2017, French company Musthane is showcasing its range of tactical mobility equipment, including its helipads. Brownout and FOD (foreign object debris or damage) increase highly the maintenance costs of helicopters by affecting the rotor wings and the engines. Moreover a significant number of helicopter crashed occurred in forward area operations where helicopters had to land on non-prepared grounds. HGH Infrared Systems has capitalized over 30 years of success in infrared technologies for security, industrial and civil applications. At the Paris Air Show 2017, being held at Le Bourget in France, HGH showcases its Spynel-S Panoramic Detection System. To meet the needs of Air Forces, Thales, in coordination with the French defence procurement agency (DGA), has developed the capabilities of the BAT-120 by adding laser guiding capability to a combat proven weapon system already qualified on the Mirage 2000, the company announced during Paris Air Show 2017. At Paris Air Show 2017, Leonardo is for the first time showcasing the new fighter attack version of the M-346, a further evolution of a family concept designed to create a common baseline, able to rapidly meet the different requirements of the air forces. Airbus Helicopters today unveiled a new concept of high-speed rotorcraft dubbed "Racer". Leading a project within the Clean Sky 2 European research programme, Airbus Helicopters has developed the compound rotorcraft configuration that is optimised for a cruise speed of approximately 400 km/h while also taking into account the tradeoffs for cost-efficiency, sustainability and mission performance. Leonardo introduces its new aerial target drone to the market at the 2017 Paris Air Show. Based on the company’s experience with its successful ‘Mirach 100/5’ target drone which has earned a place as the standard threat simulator of international Armed Forces including France, Italy and the UK, the new ‘Mirach 40’ (M-40) is designed to provide medium-to-high performance at a price comparable with competitors’ entry-level drones. MBDA presents the new SmartGlider family of guided weapons, optimised to counter anti-access strategies and other emerging battlespace threats. Planned to become available for fast jets no later than 2025, SmartGlider forms a family of all-up-round glider weapons, with folding wings and a range of over 100 km. This new generation of air-to-ground weapons is designed to counter new networked short- and medium-range surface-to-air threats, as well as moving/relocatable targets or hardened fixed targets. BIRD Aerosystems, the leading developer of Special Mission Aircraft Solutions (ASIO) and Airborne Missile Protection Systems (AMPS), presents the AeroShield POD in its full configuration for the first time at the Paris Air Show 2017, being held in Le Bourget for 19-25 June. The Ukrainian planemaker Antonov chose this 52nd edition of the Paris Air Show, being held at Le Bourget airport from June 19-25, to publicly showcase for the first time its new An-132D multipurpose transport aircraft prototype. 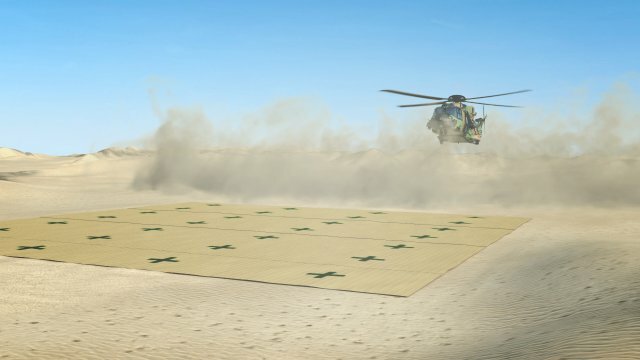 Thales has been selected by Airbus Helicopters to provide the Kuwait forces with flight and mission training solutions for the pilots and crews of its Caracal helicopters, the France-based Defense & Security giant announced on June 19, 2017. Leonardo has chosen Le Bourget air show, the well-known Paris showcase dedicated to aerospace and defence industries, for the official debut of the new M-345 trainer. The M-345, that has already raised the interest of many Air Forces, is a training jet aircraft with costs comparable to those of a turboprop aircraft but that delivers superior performances.